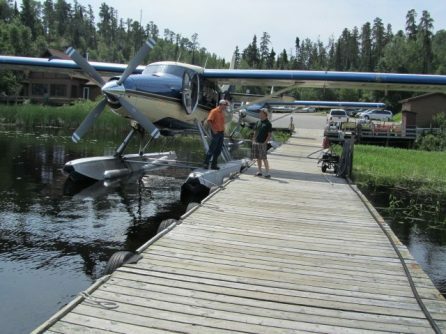 Our pilots up here at Nestor Falls Fly-In Outposts are always on the move. With 12 outposts to manage, many of which are over 100 air miles away, we couldn’t be happier to have such a talented group of pilots. Will (on the float in the picture) is our newest Turbine Otter Pilot. He came to us highly recommended by a good friend of ours up in Red Lake. Will is originally from Demorestville in Southern Ontario and was flying for 6 years all out of Red Lake in Ontario before joining our team. When he was younger, Will knew he wanted to do something revolving around hunting and fishing. So he picked flying. We’re glad he did because we love having him on the team! When he’s not in the air, Will works construction and carpentry which comes in handy in the outpost business. All of our pilots are very talented handymen, helping us keep the cabins in tip-top shape for our guests. Thank you for joining us this year, Will. We’ve had a wonderful season with you so far and look forward to seeing what next year brings!